Business Continuity Training (BCT) uses a ‘worked example’ throughout all their training courses in order to enhance the learning process and allows student to practice their business continuity skills by developing elements of the business continuity documentation of a ‘real life’ company. The company is called VIA-C and it is a training company delivering management development courses throughout the UK. You are shown the hierarchy of the organisation so that you can plan the different levels of incident management teams. You are also given details of the finance and the assets of the company so you can carry out a business impact analysis. The organisation has a number of outsourced activities such as the delivery of training and outbound sales calls; this can bring in elements of some of the difficulties in dealing with outsourced partners. 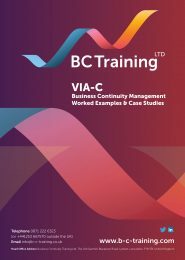 As well as being used as a case study throughout their training BCT have developed a full set of business continuity documentation for VIA-C so that students can see a worked example of a set of business continuity documentation and can compare their answers with a worked example. VIA-C has 375 staff, an annual turnover of £30m and delivers management training courses throughout the United Kingdom. The company is based in Leeds, in Titanic House and has training centers in Edinburgh and Milton Keynes. Business Continuity Management Operations Manual – This contains information on how the Business Continuity Management System (BCMS) will be run within VIA-C.
A VIA-C organogram (organisation chart) and details of the company and the roles and responsibilities of each of the different departments. The advantage of purchasing the documents is that you can use these as the basis for developing your own plans and business continuity documents and you can see in the worked example how the various elements fit together. All documents have been written to conform with the requirements of ISO22301 and can be used as the basis of an ISO22301 certification or alignment.